Breitling Navitime 8 Collection Flying… without wings? Breitling, who launched their first Navitimer back in 1952 have recently announced the latest addition to their portfolio with the introduction of the Navitimer 8 range of watches. This is the first collection to be launched under the guidance of new CEO Georges Kern and whilst some have argued for a wholesale relaunch since their acquisition by CVC Capital Partners, Kern has an eye for keeping a company true to its heritage and appears determined that the iconic brand will build upon its previously excellent reputation. There had been criticisms of late that some Breitling watches were too bulky, over-engineered or cluttered but with Kern at the helm the new range appears to have been stripped back, with smaller cases across the board and a move away from what was perceived as an overtly masculine profile. As a result, only two of the new models are actually chronographs, which in itself is a reasonably bold, perhaps even controversial move given Breitling’s strong links with aviation but it could well hint at the future direction the CEO envisages. Indeed further change comes with the company reverting to the old streamlined logo; gone are the wings and anchor synonymous with aviation and diving, with only the stylised “B” above the Breitling name remaining. 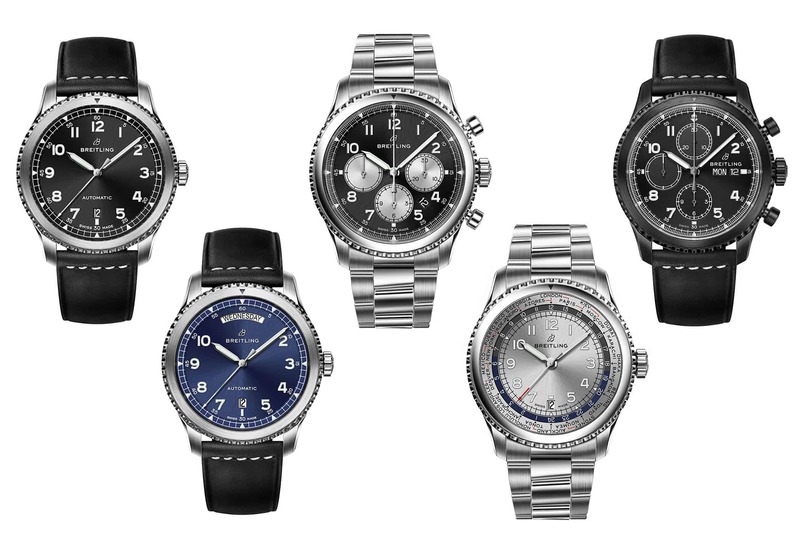 The Navitimer 8 watches take a degree of design inspiration (along with the root of their name) from the 1930’s Breitling Huit Aviation Department, so whilst obviously intended to reflect the company’s history these new models overall have a cleaner, crisper look whilst still managing to retain the character which have made Navitimers so instantly recognisable. Of the 5 new timepieces, the Navitimer 8 Automatic is essentially the entry level version. By Breitling standards, it is probably the most understated of the range, but that is not to say it is limited by any means. In fact, there are a number of design options available offering choices of case, dial, bracelet and strap. It utilises the tried and tested Caliber 17 movement and measures a reasonably wrist friendly 41mm wide and under 11mm thick. Like the rest of the range, the Navitimer 8 Automatic offers water-resistance of 100m. This is as close to a casual dress watch as you are likely to have seen from Breitling and clearly an effort to combine a little more elegance with the usual functionality one would expect. Powered by the Breitling Caliber 45 movement which offers 40 hours of reserve it is available in black or blue dial options along with either a stainless steel bracelet or black alligator leather strap. The first of the two chronographs in the range, this model features the Valjoux 7750 movement which allows the chronograph to run for up to 42 hours. Like the Automatic, it is available in black or blue dial options along with either a stainless steel bracelet or alligator leather strap. Despite sporting the usual 3 dials common to many chronographs (set in this case at the 6,9 and 12 positions) the design team have managed to keep the face itself clean and uncluttered. “Unitime” represents the only watch in the range with world-time functionality. The dial is available in either black or silver with 24 time zones printed on the outer rim. The inner section of the dial has been kept crisp and clear so as not to detract from the overall look of the piece. The B35 movement offers a whopping 70 hours of power reserve and again the watch is complemented by either a stainless steel bracelet or black alligator leather strap. The second and more expensive chronograph, the B01 is named after the Breitling movement it houses. With a 70 hour power reserve this is essentially the flag-ship model, and sits within a reasonably sized 43mm x 14mm case. Unlike the Navitimer Chronograph, the inner dials on the B01 are placed more symmetrically at the 3,6 and 9 positions. It is offered in stainless steel or gold coloured finish, the stainless version includes alternative dial and strap options although the gold coloured finish will only be paired with a brown alligator leather strap. Unlike the other models which all feature enclosed cases, the B01 features an “exhibition” case back, for those keen to see the movement inside at work! Purists may argue that 3 of the range lacking a chronograph detracts from the basic Navitime theme, or that re-launching an old favourite is too “safe” if Georges Kern intends to really make a statement and pilot Breitling to greater heights. However, Kern has shown with the likes of IWC in the past that he is an astute judge of such matters. It is clear that the designers and their CEO have thought long and hard to ensure they place the Navitime 8 in such a way that it does retain many of their historic themes and reflects the company ethos of “Instruments for Professionals”. Whilst time will literally be the judge of their success, this first offering under Kern’s tutelage may well be enough to retain many of their existing customers whilst introducing the brand to a wider audience.